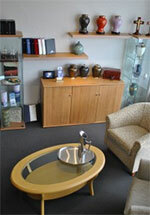 We spend every day in our funeral home, but acknowledge that you may initially feel uneasy when you first arrive. From your first contact, you will be welcomed. Our funeral home is light and serene and our meeting will take place in the comfortable arrangement room where you will be offered refreshments. We will take the time to listen to your reflections and memories of your loved one and what is most important to you about their funeral service. Listening to you and hearing your stories is not only helpful for you, but also for us, as it allows us to offer the most appropriate choices for the funeral service, rather than inundating you with options that are unsuitable or unwanted. From here we will help to create a meaningful goodbye. Are you faced with having to plan a funeral but are not sure how to begin? Sign up for our 7-part email series called About Funerals. Each email contains an important lesson based upon our years of working with thousands of families. This information will help you make the right decisions for your family regardless of which funeral director you choose. Click the image below to select to receive the email lessons all at once if your need is urgent or every other day for the next two weeks.